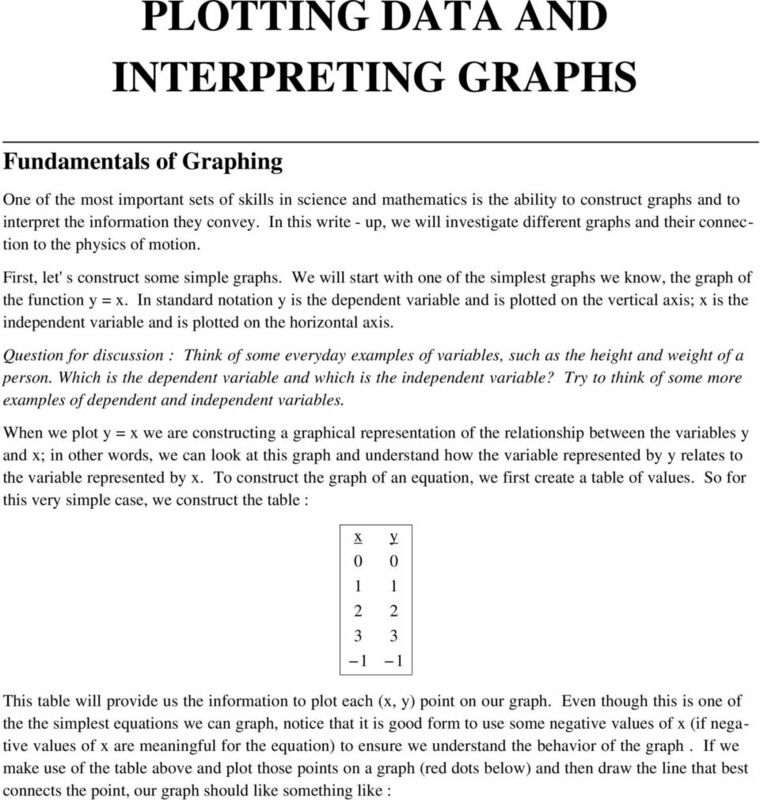 Download "PLOTTING DATA AND INTERPRETING GRAPHS"
6 6 graphing.nb y - intercept by identifying the constant term (i.e., the number added to or subtracted from the term containing "x".) Questions : Consider the straight lines : y = 2 x + 4 y = -x y = -2 x - 3 What are the slopes and y - intercepts for each function? Construct a table of values for each equation and plot these three lines on one set of axes. 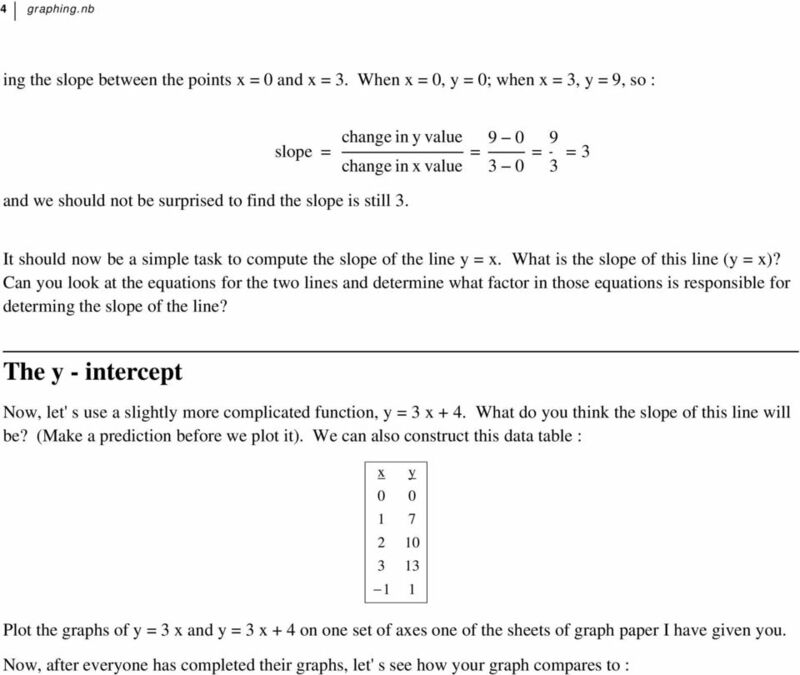 (Put your name on your graph paper and submit these graphs and tables of values before you leave tonight). 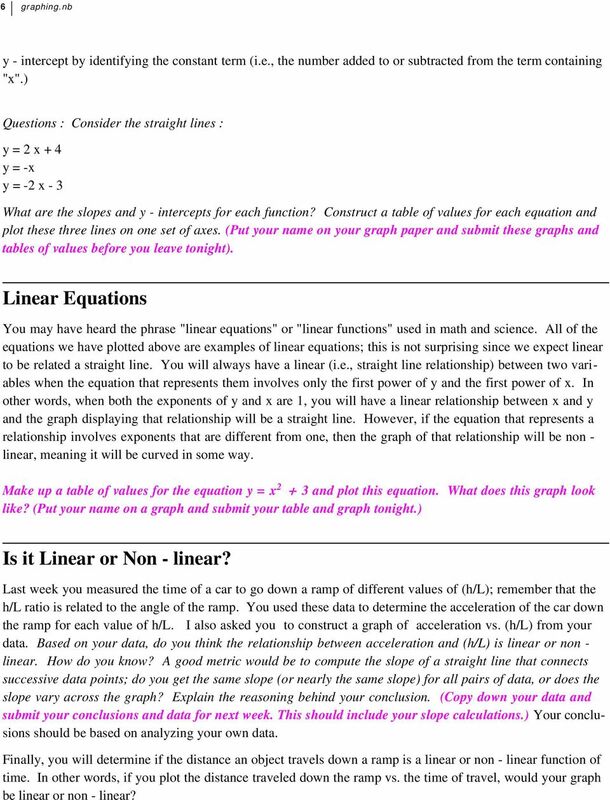 Linear Equations You may have heard the phrase "linear equations" or "linear functions" used in math and science. All of the equations we have plotted above are examples of linear equations; this is not surprising since we expect linear to be related a straight line. You will always have a linear (i.e., straight line relationship) between two variables when the equation that represents them involves only the first power of y and the first power of x. In other words, when both the exponents of y and x are 1, you will have a linear relationship between x and y and the graph displaying that relationship will be a straight line. However, if the equation that represents a relationship involves exponents that are different from one, then the graph of that relationship will be non - linear, meaning it will be curved in some way. Make up a table of values for the equation y = x and plot this equation. What does this graph look like? (Put your name on a graph and submit your table and graph tonight.) Is it Linear or Non - linear? Last week you measured the time of a car to go down a ramp of different values of (h/l); remember that the h/l ratio is related to the angle of the ramp. You used these data to determine the acceleration of the car down the ramp for each value of h/l. I also asked you to construct a graph of acceleration vs. (h/l) from your data. Based on your data, do you think the relationship between acceleration and (h/l) is linear or non - linear. How do you know? A good metric would be to compute the slope of a straight line that connects successive data points; do you get the same slope (or nearly the same slope) for all pairs of data, or does the slope vary across the graph? Explain the reasoning behind your conclusion. (Copy down your data and submit your conclusions and data for next week. This should include your slope calculations.) Your conclusions should be based on analyzing your own data. Finally, you will determine if the distance an object travels down a ramp is a linear or non - linear function of time. In other words, if you plot the distance traveled down the ramp vs. the time of travel, would your graph be linear or non - linear? 7 graphing.nb 7 Working in groups, construct an experiment (or series of experiments) that will allow you to measure the data you need to make this determination. You can use the same equipment from the last few weeks; ramps, carts, stopwatches and meter sticks. Once you have determined your procedure, carry out the observations needed. For next week, each student should submit : a clear explanation of the procedure you used; you should write this up as if you were writing the lab instructions for a middle school class experiment your data in a clear tabular form your graph of distance vs. time an explanation of your conclusion whether dist vs. time is a linear or non - linear relationship; your conclusion must be explicitly supported by your data. Each student should submit an individual report, but you should indicate who your lab partners were. 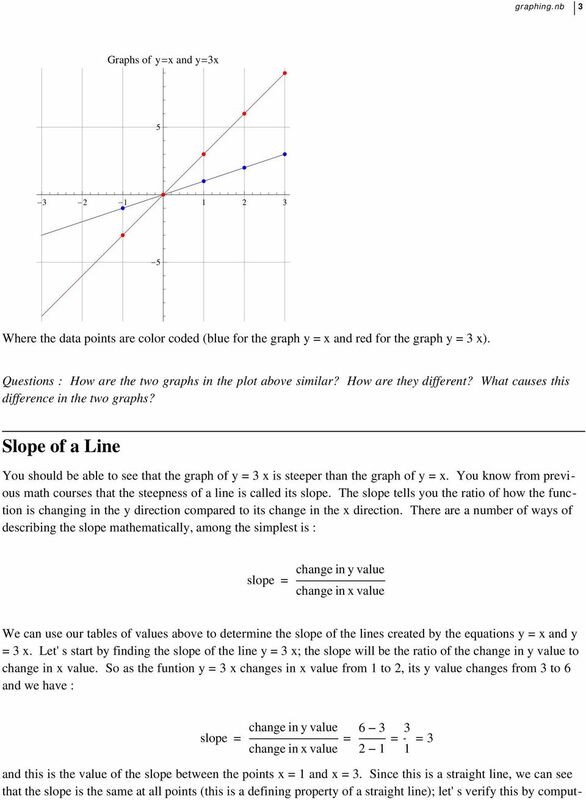 In this section, we ll review plotting points, slope of a line and different forms of an equation of a line. What does the number m in y = mx + b measure? To find out, suppose (x 1, y 1 ) and (x 2, y 2 ) are two points on the graph of y = mx + b. 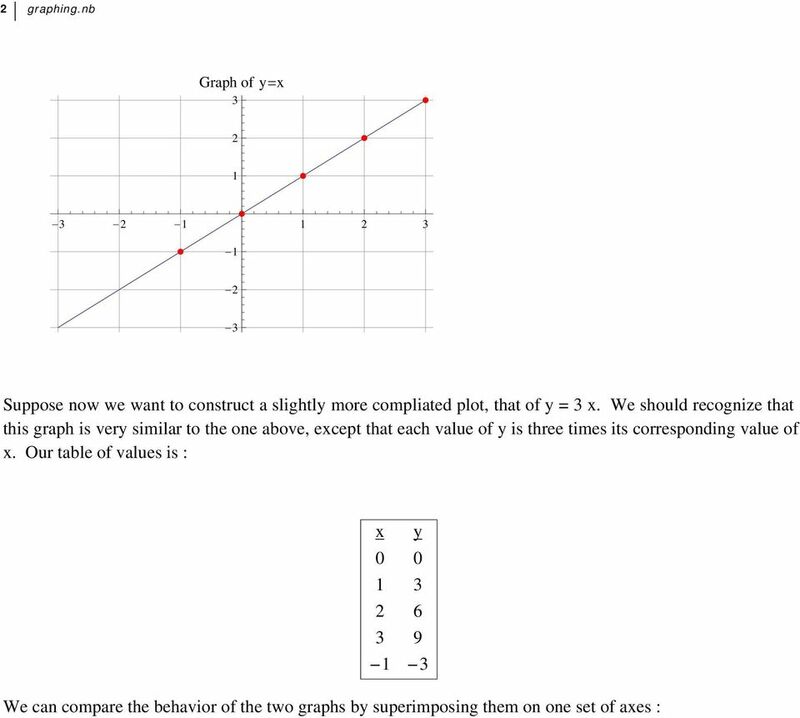 1.3 LINEAR EQUATIONS IN TWO VARIABLES. Copyright Cengage Learning. All rights reserved. Algebraic expressions are a combination of numbers and variables. Here are examples of some basic algebraic expressions. Gradient - Activity 1 Gradient from the origin. Positive numbers move to the right or up relative to the origin. Negative numbers move to the left or down relative to the origin. AP1 Oscillations. 1. Which of the following statements about a spring-block oscillator in simple harmonic motion about its equilibrium point is false? Algebra 1 Chapter 3 Vocabulary. equivalent - Equations with the same solutions as the original equation are called. Expressions and Equations Understand the connections between proportional relationships, lines, and linear equations. High School Algebra Reasoning with Equations and Inequalities Solve systems of equations. with functions, expressions and equations which follow in units 3 and 4.
. Writing Equations in Slope-Intercept Form How can ou write an equation of a line when ou are given the slope and the -intercept of the line? ACTIVITY: Writing Equations of Lines Work with a partner. 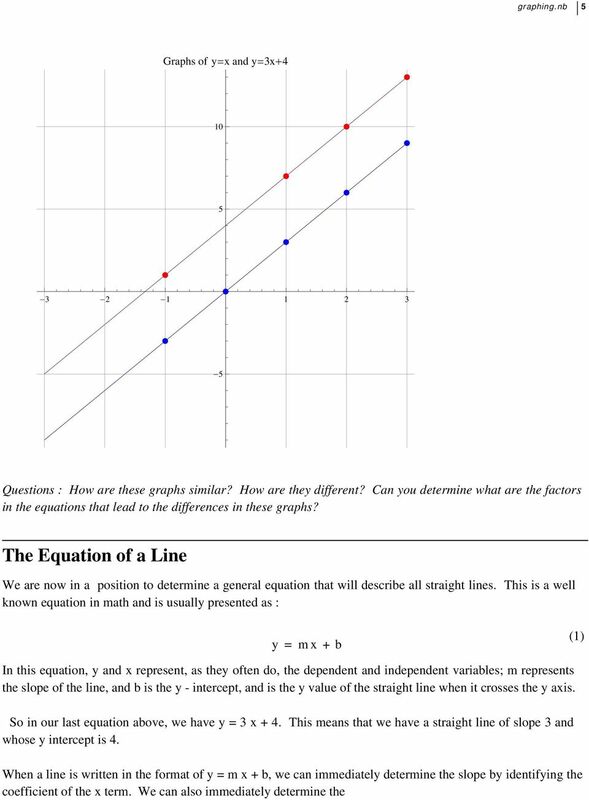 DETAILED SOLUTIONS AND CONCEPTS GRAPHICAL REPRESENTATION OF LINEAR INEQUALITIES IN TWO VARIABLES Prepared by Ingrid Stewart, Ph.D., College of Southern Nevada Please Send Questions and Comments to ingrid.stewart@csn.edu. Mathematics Common Core Domain Mathematics Common Core Cluster Mathematics Common Core Standard Number System Know that there are numbers that are not rational, and approximate them by rational numbers. Kinematics 1D ~ Lab. 4. What was the average speed of the truck for the six seconds? show your work here. 2.1 QUADRATIC FUNCTIONS AND MODELS. Copyright Cengage Learning. All rights reserved. Infinite Algebra 1 supports the teaching of the Common Core State Standards listed below. Experiment 4 Analysis by Gas Chromatography In this experiment we will study the method of gas chromatography. Gas chromatography (GC) is one of the most important analytical tools that the chemist has. Ordered Pairs. Graphing Lines and Linear Inequalities, Solving System of Linear Equations. Cartesian Coordinates System. Motion Graphs. It is said that a picture is worth a thousand words. The same can be said for a graph.